Bernie Sanders is the Democrat’s Trump. Democratic leaders may be salivating at the rise of Donald Trump in the 2016 Republican primary, thinking that he will contaminate the party’s image with his abrasive rhetoric and bombastic style. In doing so, he may be stirring up the ultra-conservative wing of the party while alienating many others. On the other hand, the Vermont senator may have the same negative impact on the Democratic party by stirring up the socialist-leaning left-wing and alienating another large segment of the electorate. Both are flying higher than any political analyst predicted. 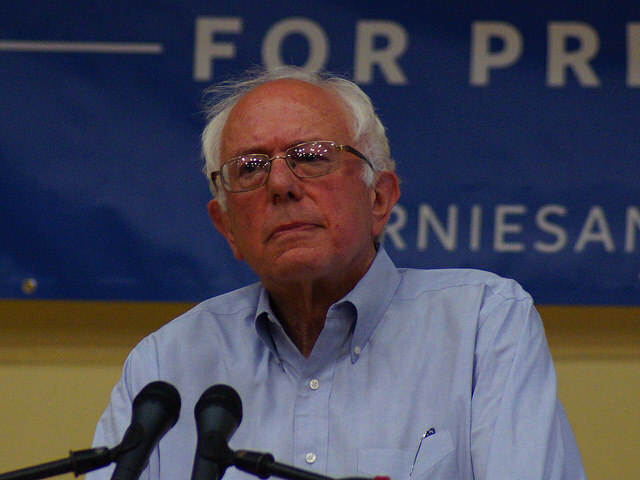 Sanders has defined himself as a democratic socialist. His campaign website clearly shows that on every issue he is to the far left of every other Democratic candidate. On the website, it can be seen that he is for income redistribution and higher taxes to make it happen. Raising the minimum wage to $15 is a priority and he favors expanding Planned Parenthood, as well as making abortions easier to obtain. In his plan, the country must legalize the 11 million immigrants who are in the country illegally. He fully supports the Iran nuclear deal and wants to strengthen unions. Climate change is definitely man-caused and the government should be involved in transforming the energy system towards energy efficiency as well as sustainability. He is for a single-payer healthcare system guaranteeing healthcare as a right of citizenship. Sanders often says that he would like the United States to be like the Scandinavian countries because they are doing better than the United States. As a result, the senator from Vermont has staked out a political position that would double down on everything President Obama has instituted and expand it even further. In order to pay for it, he recommended on a CNBC interview, a 90 percent tax rate on the wealthiest Americans. This sounds to many like socialism because it would take from the wealthy, who hire most of the workers and use much of that money to pay for the programs he espouses. The problem facing Democrats is, according to recent polls via Real Clear Politics, the disapproval rating of Obama is still hovering around 50 percent. This means that Sanders is positioning himself in an unpopular position nationally and attracting many followers to his near-socialist positions. Trump, on the other hand, has staked out his territory among the disgruntled conservatives of the far right who despise the policies of the last eight years. The followers of Sanders are unhappy because the government has not done enough to solve problems and those who follow Trump are unhappy for the opposite reason. They feel the government has intruded into their lives too much and they want it scaled back. Trump is on the opposite end of virtually every political position that Sanders has taken. These two political surprises have shocked their party leaders. No one expected Trump to do so well and no one expected a rapid rise by Sanders. Many wonder what does this mean to the campaign? Sanders is drawing huge crowds everywhere he goes because he has taken a solid stand and does not compromise his beliefs. Trump is drawing huge crowds as well and even more adamant about not compromising on the issues. Both are good communicators and should do well in the debates barring something unforeseen. Clinton is still leading, according to the RCP averages, but Sanders is quickly closing the gap. Trump is still leading nationally among the Republicans. The Republicans have a Trump problem and the Democrats have a Sanders dilemma. The Republican establishment has definitely been pushing Jeb Bush as their favorite. It is no secret that the Democratic leaders highly favor Clinton as their best hope. Both establishments have been surprised by recent developments that have, at least temporarily, taken their favorites out of contention. The rise of these two political contenders has many people wondering what is going to happen? Of course, no one knows for sure but consider this scenario. Both candidates might inspire the rise of someone least expected. On the Democratic side, it could well be Joe Biden. For the Republicans, there are several candidates who could easily rise to the top during the coming debates and put Trump on the defensive. Trump is definitely a cause for concern among the Republicans and Bernie Sanders is definitely the Democrat’s Trump. 3 Responses to "Bernie Sanders Is the Democrat’s Trump"
The analogy of this article is not even close. Bernie Sanders is more like Ronald Reagan as far as a political influence. Regardless if you agree with the policies of President Reagan or Senator Sanders. They both engaged Americans as to their views and influenced the country. Reagan did and if Sanders wins or even if he does not! Sanders has opened up his economic and foreign policy views and the seeds have been planted. The question is! How it will affect the country and to what degree be it good or bad? Thus the voters are thinking this out. I contend we will have very large turn outs in both parties in the primary and general election. Trump is a lightweight he can be compared to a used car salesman selling political snake oil. Sure some low level low IQ ding bats will follow him to the gates of hell. But in the history books of our nation, Trump will go down as one of the great comedy acts in political history. The Ringling Brothers Circus would not want to hire him, because they do not want scary clowns. Trump is also not a wise business man, His once respected business empire will be looked at with discuss and he has lost allot of customers. >>because it would take from the wealthy, who hire most of the workers and use much of that money to pay for the programs he espouses. Two logical fallacies in one sentence. Empirical evidence does not back this up, but you throw it out there as if it were common wisdom.